Newport, Christopher (bap. 1561, d. 1617), privateer and colonist, was baptized at Harwich, Essex, on 29 December 1561, the son of Christopher Newport, himself a Harwich shipmaster, and his wife, Jane. Young Christopher was serving on the Minion of London in 1580 when he jumped ship at Bahia, Brazil, but by 1584 he was back in England, an inhabitant of Limehouse, a hamlet of Stepney, Middlesex, where on 19 October he married Katherine Procter, and where in 1594 and 1599, representing Limehouse, he was chosen a vestryman. War with Spain gave Newport his opportunity. The Spanish seizure of English ships in 1585 led to privateering reprisals and Newport was soon active: in 1587, at the attack on Cadiz, as master's mate of John Watts's Drake, and in 1589 as master of Robert Cobb's Margaret of London. Newport captained Watts's Little John in 1590, making his first independent Caribbean privateering voyage and losing his right arm while attacking two Spanish treasure ships off Cuba. On 29 January 1591 he married his second wife, Ellen Ade, and as captain of Cobb's Margaret that year he combined Barbary trade with Caribbean privateering. From 1592 to 1595, however, when captaining the Golden Dragon, which belonged to Cobb's partner John More, Newport kept to the West Indies. In 1592—evidence of his increasing reputation—he was given command of a flotilla of privateers and he pioneered attacks on the towns of the Spanish Caribbean. On his return he helped to capture the Madre de Dios off the Azores and he was chosen to sail her to England. Between 1587 and 1595 Newport had been, however successful, merely an employee of leading London merchants. In 1595 his status changed when, on 1 October, he married Elizabeth Glanfield, a London goldsmith's daughter. Thereafter, with two Glanfields and three others, he owned the heavily armed Neptune, in which he raided the Spanish Caribbean almost annually until 1603. After peace was signed in 1604 he returned to the region to trade, in 1605 bringing back live from Hispaniola two young crocodiles and a wild boar, which he presented to the king. From these voyages Newport gained an unrivalled knowledge of Caribbean waters, and thus, in 1606, command of the Virginia Company's first fleet. He sailed from the Thames on 20 December in the Susan Constant, was delayed in the Downs all January, yet, sailing by the Canaries and the West Indies, he entered Chesapeake Bay in Virginia, America, on 26 April 1607. Here Newport's sole command ended. Sealed instructions brought from London appointed a council of seven, Newport being one, and ordered him to spend two months exploring the region before returning to England by May. Delays had made this timetable impossible; he could afford merely a week (21–7 May), reaching only the falls of the James. He returned to Jamestown the day after a major attack by Native Americans on it and, since swift fortification was essential, he lent sailors for the task. Within the fort he played the peacemaker, according to Gabriel Archer, but Edward Maria Wingfield, the short-lived first president of the colony, implicitly blamed Newport for inadvertently setting Archer and Bartholomew Gosnold against him. On 22 June Newport sailed for England, promising to return in November. From Plymouth on 29 July he wrote enthusiastically to the earl of Salisbury about the gold he was carrying, and by 12 August he had reached London. To the disappointment of investors, the ore was worthless, but Newport optimistically promised to bring better next time. In the John and Francis on 2 January 1608 he reached Jamestown, resuming his place on the council, seemingly as president. Half the colonists were dead, and the colony's survival depended on the Algonquian chief Powhatan. Newport secured supplies of corn from Powhatan, and he then spent a month refining ore and settling matters before sailing for England on 10 April. Another fast crossing of the Atlantic brought him to the Thames on 21 May. Again he wasted no time. In the autumn he was back in Virginia bringing seventy colonists, ceremonial gifts for Powhatan, and instructions to find Ralegh's lost colony, or the Pacific Ocean, or gold. Captain John Smith, now the colony's president, disliked both Newport's courting of Powhatan and his fruitless expedition up the James to Monacan. Again Newport did not tarry long, reaching England by mid-January 1609. In 1609 the Virginia Company was reformed. A second royal charter, which named Newport among its many adventurers, altered the form of government and in May Newport led a fleet of nine vessels to the colony. Sir Thomas Gates, a veteran of the Dutch wars, went as deputy governor, Sir George Somers was admiral, and William Strachey secretary. Though these three were ordered to cross in separate ships Newport carried them all in the Sea Adventure. The fleet was to pass west of the Canaries and 'steere away directly for Virginia without touching at the West Indies' (Purchas, 19.1). This new shorter route produced disaster. On 24 July a storm scattered the fleet and drove the Sea Adventure on to the Bermudas, but without loss of life. The islands' resources carried the survivors through the winter of 1609–10 and, after an earlier attempt failed, they reached Jamestown on 23 May. Finding it 'so full of misery and misgovernment' (ibid., 44), Gates decided to abandon it, but the arrival of the governor, Lord De La Warr, reversed this decision. When appointing his council De La Warr named Newport vice-admiral of Virginia, yet in early September Newport was back in England. 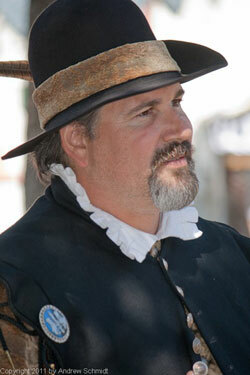 In 1611 Newport made his last voyage to Virginia (17 March–12 May), carrying Sir Thomas Dale to the colony. There Newport spent some three months, building at Jamestown a 'bridge' or quay. Departing about 20 August he reached home in late October. In appreciation the Virginia Company granted Newport thirty-two shares worth £400, which were converted after his death into 1600 acres. Another 300 were added for six men that Mrs Newport sent out in 1619, the whole perhaps being assigned at Newport News, which commemorated the captain. In 1612 Newport became a principal master of the Royal Navy, a post to which he had been granted the reversion in 1606. Thereafter Newport served the East India Company, this change perhaps being caused by an altercation with Sir Thomas Dale in 1611: Dale had pulled Newport's beard, threatening to hang him for a remark Newport had made about Sir Thomas Smith. Newport made three voyages to Bantam for the East India Company. On his first (7 January 1613–10 July 1614), in the Expedition, he carried Sir Robert Shirley, the shah's envoy, dropping him at the mouth of the Indus in late September, and reaching Bantam on 17 December, when Thomas Best reported him 'not very well' (Foster, The Voyage of Thomas Best, 74). Filling his holds swiftly Newport left on 2 January 1614 and was in the Downs on 10 July. Delighted with his efficiency, the company made no difficulty over his private trading and they 'gratified' him with 50 jacobuses, coins worth 22s., 'for landing the ambassador, discovering the Persian gulf, and a trade in the river Syndus, and bringing his men home in health with so little loss' (CSP col., 2.318). From Surat, where Roe was dropped on 25 September 1615, Newport went on to Calicut (3 March 1616) and Bantam (1–16 May) before returning to England. Before his third voyage Newport on 16 November 1616 made his will, 'being to go with the next wind and weather, captain of the Hope' (TNA: PRO, PROB 11/132, sig. 92). With him as master's mate went his son Christopher. By 16 May 1617 they were in Saldanha Bay and on 15 August at Bantam. Shortly after his arrival Newport died and was buried there. In her return the Hope called again at Saldanha Bay, where on 27 April 1618 young Christopher made his will. Proved even before his father's, it made his brother John and sister Elizabeth his chief beneficiaries. His father's will left most of his property, including a house and garden on Tower Hill, London, to his widow for life (she was still alive in 1624) and then to John and Elizabeth. The latter was also to have £400 on marriage or at age twenty-one. An erring daughter, Jane, was all but cut from the will.